HAMPTON TOWNSHIP, MI— The property has already been leveled and crews are set to pour a foundation by week’s end, but a ceremonial dig of a shovel officially launched a major development in Bay County this week. 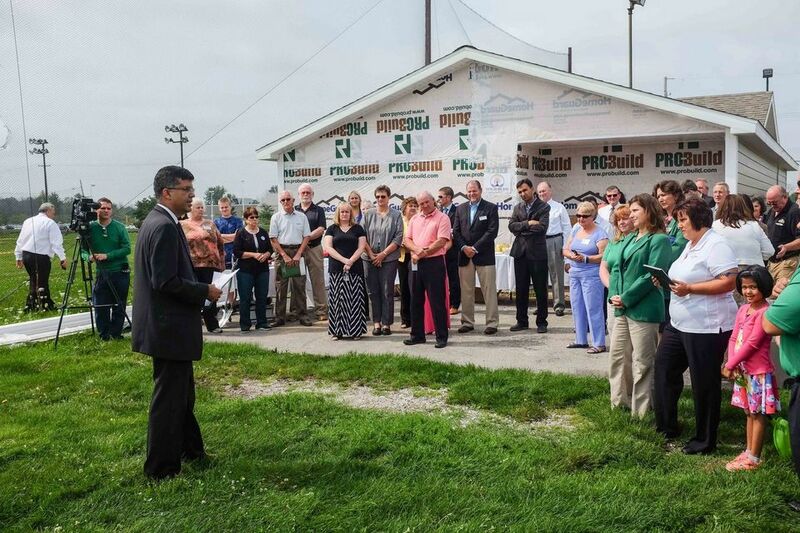 K. Rumi Shahzad, founder and operator of New Hope Valley, an assisted living memory care and soon-to-be independent living facility in Saginaw Township, was joined by nearly 50 people Monday, Aug. 31, for the groundbreaking of his new Bay County facility, called New Hope Bay. The $13 million, 84,000-square-foot facility, being built on a 14-acre parcel on Pine Road across the street from the Meijer store, is slated to open in Spring 2016. The project is bigger than initially anticipated, up from a 70,000-square-foot, 70-apartment assisted living and memory care facility, to an 84,000-square-foot, 77-apartment facility. Construction on a separate, 90,000-square-foot independent living facility would start in 2016 with a projected opening in 2017, Shahzad said. Marlette-based Korte Construction is the general contractor for the project. Ryan Carley, president and CEO of the Bay Area Chamber of Commerce, said the project fits into Bay County’s “Roadmap to the Future,” a Bay Area Community Foundation- and chamber-led 10-year community development plan. The development is actually going to be located in the Hampton Township DDA, so the township won’t see a boost in revenue. Shahzad’s Saginaw Township facility has earned him a good reputation in the local health care community. “It’s very clear that he has a passion for caring for the elderly and feels very strongly about offering great health care,” said Tony Klapish, president and chief executive officer of Renue Physical Therapy. Paul Chaffee, who sits on the New Hope Advisory Board, said New Hope Bay is going to provide a community that allows people to keep their minds sharp, while being social and making friends. “And (Shahzad) has quite a record for doing that,” he said. Monday’s groundbreaking also gave Shahzad and his team an opportunity to provide a $10,000 community service award to two organizations — $5,000 to the Save Brian’s House community group, which is reopening the former hospice facility, also in Hampton Township, and $5,000 to the St. Mary’s of Michigan Field Neurosciences Institute in Saginaw Township. “These two groups are making our community better for our seniors,” Shahzad said. The money came from donated revenues of the Fairway Golf Center, which operated on the property where New Hope Bay is being built since 1997. The driving range closed its doors in July. About $3,500 was raised and New Hope investors brought the total up to $10,000. Deliliah Maxwell, a representative of Save Brian’s House, said her group has submitted blueprint plans to Lansing for its new facility. Once approved, renovation work can begin on the former Assemblies of God church, 664 W. Nebobish, which the Save Brian’s House purchased in March for $75,000, she said. “At that point, we’re going to be busting our butts and get Brian’s House opened,” she said. New Hope Valley in Saginaw Township is at capacity, said Carlos Salamanca, leasing manager, and he’s already received some interest in the new Bay County location. “And we think there’s going to be even more interest as construction continues,” he said.